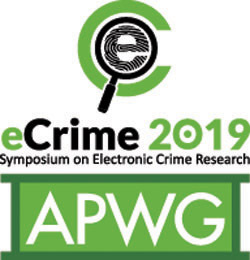 APWG is offering sponsor opportunities for the annual Symposium on Electronic Crime Research (eCrime 2019) hosted at Carnegie Mellon University, Pittsburgh, PA on November 12th-15th, 2019. eCrime 2019 will begin with a CTF Program and Workshop followed by a three-day exchange of presentations and discussions related to counter-cybercrime management and operations, eCrime research in progress, law enforcement perspectives, and opportunities for innovative research and operational projects. Download Sponsor Brochure here . . .